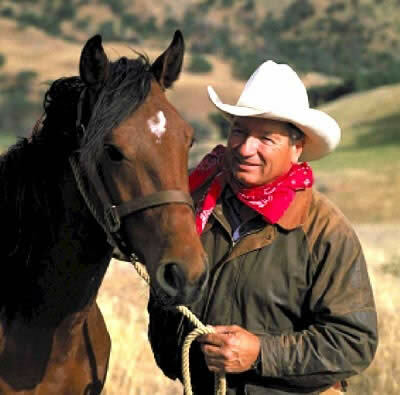 Monty Roberts and his wife, Pat, have fostered 47 children. With this kind of training in what he calls the "university of life", few would dispute his right to pen a book about human relations. Roberts has done just this - an interesting leap for a man with an international reputation as the author of "The Man Who Listens to Horses". He is a legendary horseman who believes many of the principles he applies to the training horses can be applied to getting the best out of people. Physical differences aside, there are many similarities in the brains of horses and humans. If anyone knows this, it's Monty Roberts. For the past 40 years he has been applying his equine techniques to people, and his third book, Join-Up - Horse Sense for People, focuses on changing the way people treat each other. Roberts prefers working with horses, but loves to work with people, too. "It's more of a challenge, they're more difficult, but that's not all bad. Often-times it can be very gratifying. When you've saved a human being's life it's way better than any animal you can work with, but horses are more predictable, and they're more responsive. "They don't have greed and they don't have ego that humans do. They're straightforward." Horses also do not carry an agenda to harm other creatures, unlike some people. "People have an agenda ... The only goals that horses can have is to survive and reproduce." He started watching people back in his university days, and with his wife, Pat, raised nearly four dozen foster children. "That's a university of its own." Most of the kids taken in by the Roberts' were from dysfunctional backgrounds. With these children, Roberts put into practice methods that had worked with horses. Working with people grew from there. Large corporations send executives to the Roberts' ranch to learn his ways. "When I wrote my first book (The Man who Listens to Horses) people said right away `we want a book for people', and that's how it happened." That first book contained a "hint of applicability" to humans. There was more, but on the advice of publishers, most of the references were removed for fear of criticism from psychologists and psychiatrists. "As it was my first book, and I'm not a psychologist or a psychiatrist, I had to agree with them that they were probably right. I didn't know. I only wrote what I believed. So they did pare it right down, and they said I would still come under criticism." But as it has turned out, the strongest supporters of his methods, as a group, are psychologists and psychiatrists. "They realise that my work is sound ... the weakest supporters of my work are professional horsemen." Roberts has been to New Zealand more than a dozen times, with all but one trip involved with his interests in thoroughbreds. He has brought his Join-Up tour to the country only once before, in 1999. His 2001 series of demonstrations start in Christchurch in February. Roberts has done about 700 clinics around the world. He loves it, he says, but can he keep up the pace? "I'm 65 and I don't even buy green bananas any more! You don't know what's going to happen, but each day I'll do what I like doing, and what I think is effective. My life's goal is leaving the world a better place than I found it." The huge growth in popularity of natural methods of horse training pleases Roberts. "I think it's working. I think my life's goal is going to happen." Roberts has worked with many of the leading figures in the natural horsemanship movement, notably Ray Hunt, Bill Dorrance, and Pat Parelli, who attended clinics at Roberts' property years ago. "Therein lies the centre of it all, and I have been at the forefront of encouraging people (to train horses the natural way) for 50 years now. And I am very pleased to be a fan of anybody who advocates working with horses without pain and restraint, without using what I call Neanderthal methods." But with so many people practising these methods - some with little background and experience with horses - are there not risks, to both horse and human? Roberts says that without these kinder methods people would probably go to instructors of traditional methods, and those same people would still not necessarily be any good. "But if we can make the life of the horse better by not using 8000-year-old tactics - which have made the whip the number-one selling piece of equipment in tack shops - it's better. "There was a time when it was OK to beat your wife up, and there are still places in the world where you can beat your wife with no consequences at all ... there are several places on Earth where that is perfectly fine. Does that make it right? "And if those people stop beating their wives up would they suddenly be perfect husbands? No. They wouldn't be perfect. So, if we had clinics for people to stop beating their wives, it would be better, even thought we wouldn't say they're going to turn out perfect husbands. "We're supposed to be civilised." Some horses - very few - do reach the point where, behaviourally, they can't be helped. "Hannibal Lecters," says Roberts. Roberts has seen half a dozen or so cases. "All the horses I know like that were man-made ... they were destroyed by man. They were not bad horses when they were born." He says that natural horsemanship is here to stay - it is not a fad. "Being civilised is not a fad or fashion. Some of the things that are done will inevitably be found to be fad or fashion. There are some things that I think may qualify as factors that will fade. I think the over-all premise - that if you can get a horse to want to be a partner with you, instead of forcing that horse, that will not be a fad. I believe that the world has now changed forever." Plans are afoot for two more books on horsemanship in about a year. These books, one for children and one for adults, will be Roberts' first how-to books. His other book, Shy Boy, is about Roberts' journey to tame a wild mustang. Horses - and people - aside, Roberts won't have much time to relax in New Zealand. It's an "extra-favourite place", but with his brutal schedule he won't get to see much this trip. "But I'm going to try to have another day of fishing - I love to fly fish." South Island trout, be warned. Join-Up - Horse Sense for People, by Monty Roberts. HarperCollins, RRP $29.95. 246pp.